Velvet Art in classic Mandala designs! Velvet Art in classic Mandala designs! 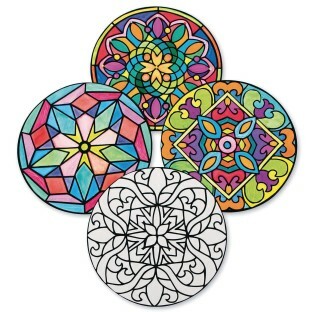 Easy to color with markers or crayons to achieve great results every time. Raised velvet areas make it easy to stay in the lines. Accent with glitter glue or gems for extra sparkle! Each cardstock mandala is 9” in diameter. Pack of 40 includes 10 each of 4 beautifully detailed designs.